Calamus occidentalis Witono & J.Dransf. Ujung Kulon, West Java (endemic? ); occurring in rather disturbed primary and secondary lowland rain forest overlying recent coral limestone and volcanics at altitudes up to about 200 m.
Solitary high-climbing rattan with stem reaching to 100 m in length, looping in lower part of stem. Stem without sheaths to 30 mm diam., with sheaths to 70 mm diam. ; internodes 18 - 30 cm long. Leaf sheath green when fresh, drying brownish green, covered in caducous brown indumentum, and armed with short black irregularly arranged spines, to 15 x 2 mm with pale bases; knee conspicuous, unarmed; ocrea ill-defined. Leaves cirrate to 3 m long including cirrus; cirrus up to 1.5 m long with brown claws; petiole in adult plants absent or to 2 cm long; rachis green, flattened adaxially, convex abaxially, armed with irregularly arranged brown spines on adaxial side and black claws on abaxial side, adaxial side more densely armed than the abaxial side, spines; leaflets up to 20 on each side of rachis, regularly arranged, 4 - 9 cm apart, lanceolate, apex acuminate, base acute, middle longest, 15 - 31 x 3 - 5 cm, the surfaces concolorous, green when fresh, drying yellowish green, mid- and marginal veins on adaxial surface armed with black bristles, secondary parallel veins very thin. Staminate inflorescence eflagellate, branched to 3 orders, partial inflorescences up to 17, the longest to 62 cm long; rachis bracts tightly tubular, to 9 x 1.5 cm, armed rather densely with black tipped, reflexed spines distally; rachillae to 22 mm long, sessile, basally enclosed by the bract, with c. 12 - 15 flowers on each side; rachilla bracts and bracteoles explanate, with dentate margins and bearing sparse brown scales. Staminate flower (immature) globular, c. 2 mm diam. ; calyx to 1.5 mm, split to 0.75 mm; petals c. 2 x 1 mm, shining; stamens very immature. 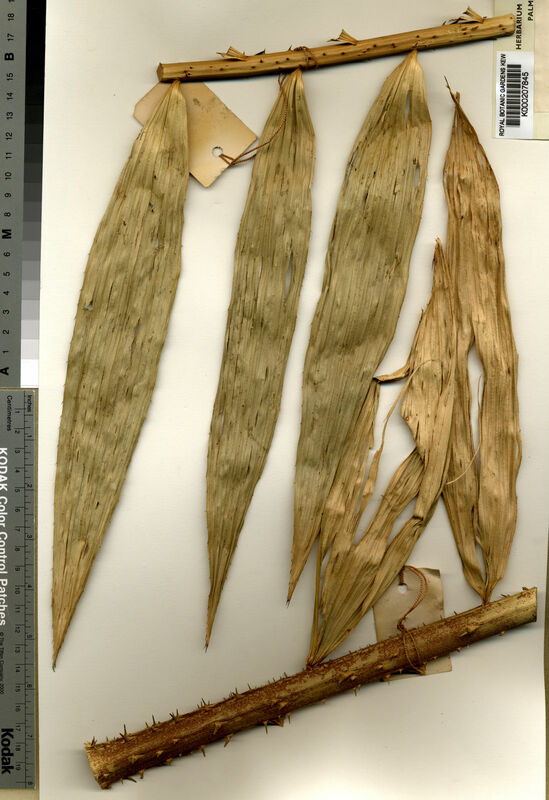 Pistillate inflorescence to 1.5 m long, similar to the staminate but branching to two orders only and with longer, more robust rachillae, to 10 - 25 cm long, bearing 8 - 20 rather distant dyads on each side; rachilla bracts explanate, striate, bearing scattered brown scales; involucrophore very short, less than 1 mm high. Sterile staminate flower to 2.2 x 1.1 mm; calyx 3-lobed, to 1 x 1.5 mm, basal tube to 2 x 1 mm; petals to 2 x 1 mm; sterile stamens to 1 x 0.3 mm. Pistillate flower larger than the staminate; calyx to 2.5 mm, with glabrous, striate triangular lobes to 1 x 2 mm; petals to 3 x 1.5 mm; ovary 1 mm in diameter, ellipsoid, tipped with 3 stigmas. Flowers of both sexes at anthesis smelling of Pandanus amaryllifolius leaves. Fruit globose-ovoid, 18 - 19 x 12 - 14 mm, covered in 15 vertical rows of straw-coloured scales. Seed c. 10 mm diam., irregularly pitted and warted; endosperm deeply ruminate; embryo basal. inter species Javanicas habitu solitario, magnitudine grande, foliis cirratis foliolis late lanceolatis, rachillis sessilibus rectis distinctissima; ad sectionem Phyllanthectum Furtadonis (Gregem XV Beccari) pertinens, C. manan et speciebus propinquis affinis sed vaginis folii spinis parvis dispersis indumento badio dense tectis et fructo parvo semine irregulariter foveolato pustulatoque differt.